In line with new Data Protection requirements, I start this blog post with a reminder to all of you who are signed up to receive notification of a new blog post, that we keep the email and the given name purely for purpose of notification. New subscribers are notified of this as they join the subscription list, but if this is a problem for any one who has already joined, please contact me at nc(at)royalasiaticsociety.org and I will remove you from the list. 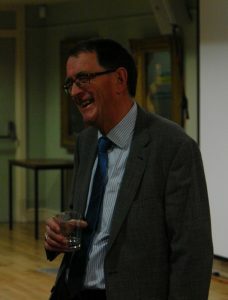 Last night (Thursday 10th May) was the Society’s Anniversary General Meeting chaired by outgoing President, Dr Gordon Johnson. 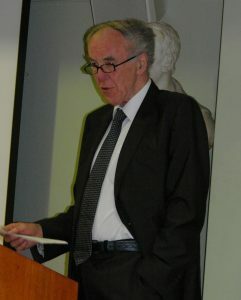 Both he and treasurer, Lionel Knight gave favourable reports of the current position of the Society and all the activities with which it is involved. 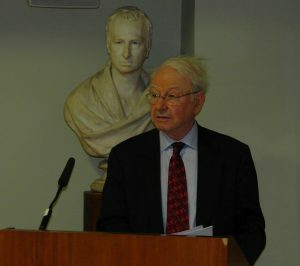 The Meeting was followed by the Anniversary Lecture, this year delivered by Professor Charles Melville from the University of Cambridge. He spoke on some of his current research on the illustrations in Persian manuscripts, particularly focusing on those in Mirkhwand’s Rudat al-safa in the Society’s Persian manuscript, RAS Ms. P.38. 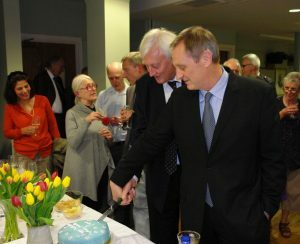 The lecture was followed by a reception at which not only the current success of the Society was celebrated . It transpired that it was birthdays of both Professor Melville and Council Member, Dr Randolph Cooper. And so a celebratory cake was duly cut and enjoyed. 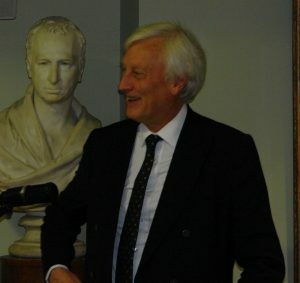 The previous Thursday, Professor Anthony Stockwell (out-going Vice-President and incoming President), gave the lecture, “Plunder and Restitution: Britain and the Mandalay Regalia”, at the Society. He spoke of the history of the plunder of these treasures from the palace of King Thibaw, how they came to be housed in the Victoria and Albert Museum, and the subsequent decision to restore them to Burma, where they are now on display in the National Museum of Myanmar in Dagon, Yangon. Professor Anthony Stockwell in conversation before his lecture. The Anniversary General Meeting is always a time to take stock and celebrate some of the achievements of the Society and the people who are associated with it. So I thought that I would use the rest of this blog post to continue to highlight the veritable Who’s who of past recipients of the Society’s Triennial Gold Medal. 1938 – Professor R.A. Nicholson (1868-1945) – Reynold Alleyne Nicholson was born in Yorkshire in 1868. He was educated at Aberdeen and Cambridge Universities before becoming Professor of Persian at University College, London, from 1901-1902. He then became lecturer in Persian at the University of Cambridge from 1902 to 1926, and Sir Thomas Adams’s Professor of Arabic at the University of Cambridge from 1926 to 1933. He was a scholar in Islamic literature and Islamic mysticism. He studied and translated major Sufi texts in Arabic, Persian, and Ottoman Turkish to English. Nicholson wrote two influential books: Literary History of The Arabs (1907) and The Mystics of Islam (1914). 1941 – Professor F.W. Thomas (1867-1956) – Frederick William Thomas was born in Staffordshire in 1867. He was educated at Trinity College, Cambridge in 1885, graduating with a first class degree in both classics and Indian languages and being awarded a Browne medal in both 1888 and 1889. Thomas was a librarian at the India Office Library (now subsumed into the British Library) between 1898 and 1927. Simultaneously he was lecturer in comparative philology at University College, London, from 1908 to 1935, Reader in Tibetan at London University from 1909 to 1937, and the Boden Professor of Sanskrit at Oxford University between 1927 and 1937, in which capacity he became a fellow of Balliol College. He studied and catalogued many Tibetan texts. Thomas died on 6 May 1956. 1944 – Sir John Marshall (1876-1958) – John Hubert Marshall was born in Chester in 1876. He graduated from Kings College Cambridge and in 1902 was appointed Director-General of Archaeology within the British Indian administration. Marshall modernised the approach to archaeology, introducing a programme of cataloguing and conservation of ancient monuments and artefacts. In 1913, he began the excavations at Taxila, which lasted for twenty years. In 1918, he laid the foundation stone for the Taxila Museum, which today hosts many artifacts and one of Marshall’s few portraits. He then moved on to other sites, including the Buddhist centres of Sanchi and Sarnath. His work provided evidence of the age of Indian civilisation especially the Indus Valley Civilization and Mauryan age (Ashoka’s Age). Marshall was appointed a Companion of the Order of the Indian Empire (CIE) in June 1910 and knighted in January 1915. 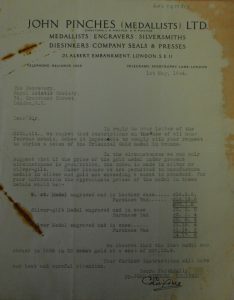 Letter from John Pinches, Medallist, to the Secretary of the Royal Asiatic Society to explain the restrictions on metals in the current situation and to give various options and estimates for possible casting of the Medal, dated 1 May 1944. 1947 – Sir Richard Winstedt (1878-1966) – Richard Olaf Winstedt was born in Oxford and graduated from New College, Oxford. In 1902 he became a cadet in the Federated Malay States Civil Service, and was posted to Perak where he studied Malay language and culture. In 1913 he was appointed District Officer in Kuala Pilah, and in 1916 appointed to the Education Department. In 1920 he received his DLitt degree from Oxford. He served as the first President of Raffles College, Singapore, 1928–1931. During his presidency, he also served as acting Secretary to the High Commissioner, 1923, Director of Education for Straits Settlements and Federated Malay States (FMS), as a member of Legislative Council, Straits Settlements, 1924–1931 and as a member of the FMS Federal Council, 1927–1931. He was president of the Malayan Branch of the Royal Asiatic Society in 1927, 1929 and 1931. After a term as General Adviser to Johore, 1931–1935, Winstedt retired from the Malayan Civil Service. On retirement he became active in the Royal Asiatic Society serving in several positions over many years. 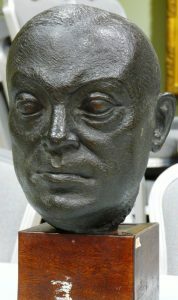 Sir Richard Winstedt sculpted by Dora Gordine, commissioned by Winstedt and now in the RAS Collections. 1950 – Dr L.D. Barnett (1871-1960) – Lionel David Barnett was born in Liverpool and educated in Liverpool and Trinity College, Cambridge. In 1899, he joined the British Museum as Assistant Keeper in the Department of Oriental Printed Books and Manuscripts. In 1908 he became Keeper, remaining in the post until his retirement in 1936. He was also Professor of Sanskrit at University College, London, from 1906 to 1917, founding Lecturer in Sanskrit at the School of Oriental Studies (1917–1948), Lecturer in Ancient Indian History and Epigraphy (1922–1948), and Librarian of the School (1940–1947). In 1948, at the age of 77, he rejoined the British Museum, which was desperately short of staff, as an Assistant Keeper, remaining there until his death. 1953 – Sir Ralph Turner (1888-1983) – Ralph Lilley Turner was born in London in 1888, and educated in London and at Christ’s College, Cambridge. In 1913, he joined the Indian Educational Service as a lecturer at Queen’s College, Benares. From 1915 to 1919, he served with the 2nd battalion, 3rd Queen Alexandra’s Own Gurkha Rifles in the British Indian Army during World War I, winning the Military Cross in Palestine. From 1920 to 1922, he was Professor of Indian Linguistics at Benares Hindu University. In 1922, Turner returned to England as Professor of Sanskrit at the School of Oriental Studies at the University of London. Between 1924 and 1932, he also published several papers on Romani Studies in the Journal of the Gypsy Lore Society, including “On the position of Romani in Indo-Aryan” (1927). He was Director of the school from 1937 to 1957, although he continued to occupy his Chair as well until 1954. He was knighted in 1950. His magnum opus, the Comparative Dictionary of the Indo-Aryan languages was published in 1966. 1956 – Professor W. Perceval Yetts (1878-1957) – Walter Perceval Yetts was born in Reading and educated in London and Lausanne. He entered the Royal Navy Medical Service in 1903 and retired with the rank of staff surgeon in 1912. He was acting medical officer at the British legation in 1913 and served in the Royal Army Medical Corps during World War I. From 1920 to 1927 he was a medical officer in the Ministry of Health. In 1930 he made a major career change when he was appointed the first lecturer in Chinese art and archaeology at the School of Oriental Studies at London University. In 1932 he became Professor of Chinese Art and Archaeology at London University and held the post until his retirement in 1946. 1959 – Sir Archibald Creswell (1879-1974) – Sir Keppel Archibald Cameron Creswell was born and educated in London. He developed considerable skills in draughtsmanship and worked for Siemens Brothers and then, from 1914, the Deutsche Bank in London. By 1910 his interests were drawn to Islamic architecture for which he started collecting a library that was eventually to become one of the most comprehensive private collections of its kind. As well as working at his engineering day job, he spent time studying eastern architecture. In May 1914 he applied, unsuccessfully, to join the Archaeological Survey of India. 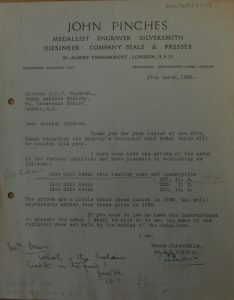 The First World War broke out in August of that year, and in April 1916 he was selected on probation for appointment as Assistant Equipment Officer in the Royal Flying Corps. Some time afterwards he was posted to Egypt. He rose through the ranks, and by July 1919 had been appointed (as an Army Captain) as Inspector of Monuments under General Allenby’s Occupied Enemy Territory Administration in Palestine and Syria. In May 1920 Creswell drew up a proposal for a History of the Muslim Architecture of Egypt – this project was to continue until his death in 1974 with a sixth volume prepared but unpublished at that time. Creswell was appointed a lecturer at Fuad University (now Cairo University) in Cairo in 1931, and within three years was made Professor of Islamic Art and Architecture. He held this post until 1951. In 1956 he was appointed a Distinguished Professor of Islamic Art and Architecture at the American University in Cairo. In June 1973, his health failing, Creswell returned to England. He died on 8 April 1974. The remaining recipients of the Triennial Gold Medal we will save for a future blog post when we will discover more experts in the fields of Asian studies. Next week we are hosting two lectures. On Tuesday 15th May, as part of the RAS Lecture Series, Dr. Deniz Tuerker (University of Cambridge) will lecture on “The Yildiz Kiosk and the Queen Mothers of the Tanzimat Era: Gender, Landscape and Visibility”. On Thursday 17th May Dr. Indira Viswanathan Peterson (Professor of Asian Studies, Emerita, Mount Holyoke College, USA) will give a Guest Lecture on the “Royal Asiatic Society’s recruitment of elite Indians in its foundational years, making specific reference to the relationship between the RAS Vice-President Sir Alexander Johnston (1775-1849) and King Serfoji II of Tanjore (r. 1798-1832)”. Both lectures take place at 6.30pm and we hope that we will be able to welcome you here.